May 27 1909 -- Herriman offers up a miscellany of sketches gleaned at the ballgame; the leftmost is interesting in that, yes Virginia, there was a time when baseball teams needed those balls back that went up into the stands -- evidently not without the problem of souvenir collectors who didn't go along with custom. 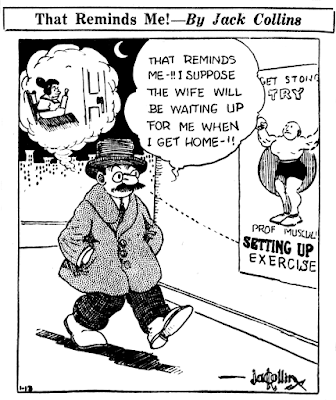 The middle cartoon is interesting in that it shows Herriman offering up some meta material in the tags for the sun, sea, and beach. That sort of thing would become a hallmark of his later work, but not much seen in his Examiner cartoons. Poor Mark Johnson, who really dislikes Albert Carmichael's artwork, is really gonna hate this card, with perhaps the most slapdash rendition of a cute girl you're likely to come across. Okay, okay, after this one I'll give the Carmichael cards a rest for awhile. Although this card is obviously part of the Taylor Pratt & Company Series 565, the reverse does not have the company's logo or series info on it. Could the company have been embarrassed by this card, too? Now my efforts centered on getting away from the Boston American. The icy waters into which Carvalho had plunged me benumbed my spirit no more than chilling drafts from other sources. A rift had come in my priceless friendship with Foster Coates. All the generosity of the sponsorship he had accorded me as an editor was replaced by the grimness of his opposition to me as a publisher. Crossing swords with him was for me a species of flagellation. Coates was assigned to the Boston American a week after my designation as publisher to succeed Farrelly. Hearst had summoned me to New York for a conference. It was two in the morning when I found him in the Rhinelander Building. He was bent over a page form, directing its make-up. Perspiration poured down his face. He dashed it off occasionally with his forefinger, like a laborer at a rockpile. It was a much more convincing gesture than the last pose in which I had seen him, full length on a floor, completely surrounded by colored comic sections. An hour later, we met in a small, boxlike inclosure that he used as an office on the floor below. He accepted my judgment that the gravest symptoms in Boston resulted from the need for a new managing editor and for a general manager of advertising. Three days later, Coates arrived, followed the next week by Russell R. Whitman from Chicago. Whitman was to act as director of advertising sales. Hearst was backing me up without stint. My confidence in the Boston American soared. A month later, it was in the depths. At Coates’s request, one of Max Annenberg’s assistants, Harry L. Starkey, was brought from Chicago. He acted as technical adviser on distribution. In Chicago, Starkey had been a “ripping, roaring tiger.” In Boston, he behaved more like a mewling tabby. “I used to know where to look to dodge a knife in Chicago,” he confided to me, “but here they don’t even let you see it. The blade is sunk before you know about it.” Which explains why this aggressor in the windy West became an appeaser in the wily East. My breach with Coates came over my rejection of Starkey’s plans to boost news sales by “buying” the favor of dealers with bonuses. The Boston American was insolvent; Carvalho declined to advance sorely needed funds; Coates cast aside our friendship in anger over my refusal to go deeper into debt; Hearst continued blithely to order new features at additional expense and—just how much fortitude might one job require? Repeated trips to New York got me no closer to a solution of the dilemma than a form of Carvalho diplomacy I had not previously observed. It was a reticence as bland as that of Bret Harte’s heathen Chinee. My appeals for release were parried. 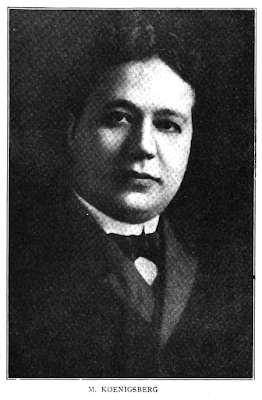 John H. Fahey was publisher of the Traveler. His keenness has been evidenced by conspicuous activity in press association, shipping and governmental affairs for several decades. Individuals in control of the shoe-machinery trust were disinclined to approve the publication in Boston of a newspaper owned by W. R. Hearst. It would not be amiss to say they didn’t like him. They cordially detested everything he stood for, especially in journalism and politics. They were persuaded that the Traveler could “put the American out of business.” So they dumped barrel-loads of money into the Traveler. Fahey was disbursing one $250,000 installment of this endowment when we came to grips. There was nothing in the catalogue of competitive tricks that remained untried by one or the other side. Each was “out to win by any means short of crime.” And it isn’t certain that all the underlings in both camps always fell short of the dividing line. But Fahey invariably played cricket. The Traveler used presses one plate wide. That meant the printing of an edition could begin less than a minute after the stereotype starter was ready. More than twice as much time was necessary to commence grinding out the American on double widths of cylinders. So the Traveler was enabled to “blanket” the newsboys with a supply of newspapers at various centers ahead of its competitor. A larger volume of production permitted the American to smother that handicap on later distribution. But the daily beating on first deliveries grew exasperating. A somewhat spectacular operation was devised to offset this handicap. It became a routine during the baseball season. Statistics showed that for several years a large majority of ball games had been decided before the eighth inning. So, at the end of the seventh inning, the American’s sporting edition was sent to press. The leading team was announced as the final winner in a headline in red ink across the top of the first page. These papers were loaded on trucks. Red and green electric bulbs, strung along adjacent streets, would signal the drivers either to spurt to designated points or to unload a worthless issue. Usually more than 30,000 copies had been packed in readiness in the automobiles before the ninth inning was over. A shift of the lead or a tied score rendered them useless. A heavy waste accumulated. But that didn’t faze John Fahey. He duplicated the practice. With what was designed as consummate artfulness, but which later graded as superfluous finesse, I proposed to Fahey to abandon this “cutthroat” competition. He agreed. It was stipulated that the printing of corresponding editions should begin simultaneously. A detailed schedule was perfected. The American and the Traveler occupied adjoining plants. A hole was knocked through the basement wall so that mutual compliance with every particular of our compact could be closely observed. Thereafter, a watcher for each paper flashed the order for the starting of the other’s presses. Of course, that meant a great advantage to the American. But Fahey hadn’t been fooled. He had no choice. His purse strings had been abruptly tightened. The coup, for which I was tempted to credit myself, worked out as a face-saving for Fahey. After fourteen months of my term of nerve abrasion and emotional attrition in Boston, Hearst consented to discuss my repeated requests for a transfer. He listened to my statements of unfitness for the position. He seemed especially interested in my anxiety to escape friction with Coates. Apparently, nothing was left except to choose my next berth. But I had not yet learned how Hearst’s tenacity in any transaction fed on the reluctance of the other fellow. It was nearly daybreak when he withdrew to the next room. An hour later, when I felt sure Hearst had forgotten that I was waiting, his secretary, L. J. O’Reilly, entered. O’Reilly handed me an envelope. “Mr. Hearst instructs that you read this and deliver it to Mr. Carvalho,” he said. “It has been bad enough,” Carvalho commented, “but this would make it impossible. If you will hold your peace long enough, I’ll undertake to get you out of Boston.” At that moment, Carvalho was in my eyes a potential benefactor. Six weeks later, he laid upon me a bitter hostility. In April, 1909, true to his promise, he telegraphed, directing me to turn over to Whitman all pending matters in my hands and come to New York. The next day Carvalho outlined the most welcome assignment I had yet received—the management of the Hearst telegraph news systems and feature syndicates. This embraced the nature of work for which I felt myself best fitted—service free from any advertising, political, counting-room or local encumbrances and devised exclusively for the reader. There would be no dependence on individual favor. No single proprietor would waylay initiative, balk enterprise or impose abortive policy. Success would be determined by a sort of elective process—by the verdicts of clients, most of them outside the Hearst circle. But my elation over this most desirable opportunity was rudely dashed. Eight years were to elapse before I got the job. Outside Carvalho’s office Richard A. Farrelly stopped me for a chat. A week before he had discussed with me his orders to launch and edit a ten-cent magazine for Hearst. Now he was curious about my affairs. He felicitated me on being “a fellow refugee from ‘the black hole’ of Boston.” Had I received any new sailing orders? Exuberance over the most attractive position yet assigned to me wagged my tongue. Anyhow, why shouldn’t Farrelly know of my good fortune? Twice my immediate superior and high in Hearst’s confidence, he should be a fit recipient of my cheerful tidings. Weeks passed before I learned how ill-advised had been that conclusion. Only on the previous day, Farrelly was notified that the project for a new magazine had been abandoned. That eliminated his prospective editorship. He immediately renewed to Carvalho a proposal he had been urging for months. It covered a reorganization of the department, the management of which I was now telling him had been committed to me. Carvalho had stalled Farrelly. While I was on my way out of the building, Farrelly intercepted Carvalho on his way home. They had been friends since boyhood. Farrelly upbraided Carvalho for turning over to me, without notice to him, the post for which he had applied. The grievance this brewed against me in Carvalho’s mind gained a full month’s impetus before it burst. I was reporting for duty early in May, after a vacation at San Antonio. Carvalho denounced me for “violating a fundamental principle of sound business relations.” My contract would expire in a couple of months. I could draw salary for the unexpired term immediately or I could have the checks mailed to me weekly. Meanwhile, he had nothing and he would have nothing for me to do. Of course, there was an indignant demand for an explanation. It evoked the heinous charge that I had ignored his instruction for secrecy. The heat of my denial fired a grudge that smoldered between us for four years. There were half a dozen droll interludes in this quarrel. Under directions from Hearst, Carvalho executed three different personal service contracts with me. Each document was signed in duplicate without the exchange of one word. On several occasions, Carvalho found it necessary to analyze in my presence agreements I had negotiated with motion picture or other companies. Our deportment at each meeting would have belonged better in a stage satire than a business discussion. The break with Carvalho exposed a cross-section of the Hearst organization, as pitilessly revealing as the woodsman’s ax hewing through a timber. It laid bare innermost oddities of that colorful company of individualists who, under Hearst’s leadership, revised the topographic conformations of the Fourth Estate, lifting and altering if not embellishing the face of journalism. It presented a picture of absurdly strenuous confusion. An apt title might have been: “All in Frenzied Fun.” While it did show a panorama of incongruities, there was some exaggeration in the description of a setting into which one might expect at any moment the entrance of a troop of cross-eyed giants playing leap frog with bow-legged midgets on stilts. An oral report to Hearst on my trip to San Antonio was in order. He had authorized me to investigate the desirability of buying the San Antonio Express. That authorization forged the first link in a collateral relationship that grew to earn from Hearst a much keener interest than he gave to the performance of my regular duties. It revolved around an obsession—a yearning for the ownership of a newspaper in every advantageous center in America. By gratifying that ambition, he could command the performance of any program he favored, including his installation in the White House. First, I told Hearst that R. H. Russell, publisher of the Express, had set a prohibitive price on the property—$600,000. Then, I mentioned the fact that Carvalho had greased the skids for my exit. It is amusing to recall Hearst’s look of distress. Maybe it only expressed an aversion for such a subject of conversation. It was not easy to believe that he had been unaware of Carvalho’s action. Hearst volunteered to “see what he could do about it,” This elicited a statement that I was not actually leaving his employment; that William Bradford Merrill, manager of the New York American, had proposed to engage me under a contract to produce a special edition to be published in the following November; and that the prospective undertaking—the tentative title of which was “Southern Prosperity Parade”—promised to prove both interesting and lucrative. Hearst nodded approval. That assent armored me against a series of attacks so preposterous that it is still difficult to believe they occurred. Arthur Brisbane, editor of the Hearst evening papers, cheerfully agreed to write several articles for the issue I was preparing. He showed a remarkably ready compliance in such matters. His typewriter fairly leaped to the mere hint of an idea that might multiply advertising dollars. No matter how vulgarly commercial the topic, a classic essay was forthcoming. Brisbane everted the human soul to prove why housewives should do their shopping on the days preferred by the biggest advertisers; he recaptured from the planets a formula to demonstrate the superiority of the latest automobile transmission; he dug from the strata of the Silurian age a fossil to illustrate the virtues of a new cleansing liquid. Editorials in the New York Journal worked miracles of theatrical resuscitation. Producers, having decided to close plays, were persuaded to use doses of the Brisbane elixir. The shows revived. So accommodating was the illustrious editor that resourceful advertising solicitors were encouraged to flights of unbelievable audacity. They submitted proposals for articles expatiating on the connubial bliss to be derived from the use of a trademarked bunion-eradicator; the winning personality to be developed in business as well as romance by the wearing of a certain patented garter; or the guaranty against marital disaster contained in every deed to a lot in a restricted suburban area. Brisbane didn’t get around to these particular propositions, but he did bastardize enough editorial columns to corrupt the morale of a considerable part of the space-selling fraternity. There was a specific cause for this complaisance. It might have been distasteful to his more ardent admirers. It proved the extraordinary flexibility of his extraordinary talents. His contract with Hearst assured extra compensation for these extra-editorial lucubrations. 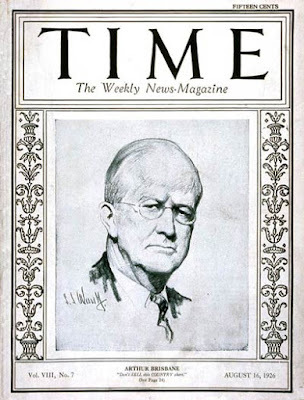 The larger part of this character of activity came before Brisbane inaugurated the “Today” column which won for him indisputable recognition as “The World’s Foremost Commentator on Current Events.” It also came before his accumulation of wealth assumed precedence over all his avocations. Taking a leaf out of Carvalho’s book, I pledged Brisbane to a secrecy to be maintained until necessary formal announcements could be made. The next week Hearst sailed abroad. Two days later Merrill called me into conference. He wanted to know why, when and where I had approached Brisbane for help. Merrill was no more given to garrulity than Carvalho. So he added nothing to my information beyond the inescapable conclusion that Brisbane had broken his word to me. “The Silver Fox” was by no means an ill-chosen appellation for Merrill. His lustrous white hair, though fast thinning, crowned an impressive countenance in which affability seemed to preside over intelligence and refinement. Each line spelled a wedding of form and force. In later years, at more than a score of public functions, Brisbane was always seated at my left and Merrill at my right. Brisbane excited more curiosity at a gathering of journalists than anyone else. Merrill’s presence radiated an aura of greater distinction than was projected by any other personality at newspaper assemblies in those years. The showmanship of that arrangement offered no clue to the satiric comedy which it hid. It is doubtful that either Brisbane or Merrill could think of anyone whose proximity he would enjoy less. Brisbane excelled in many mental arenas, but he was at his best in rationalization. There were few deviations from the true beyond correction or even justification with his glib logic. His facility in these matters was aided by a rare amenability of conscience. If there were any ethical shackles to restrain his reasoning, they didn’t clank in his utterances. He wasn’t the least bit ruffled by my reproach for violating his promise. “I never recognize any pledge infringing on my loyalty to Hearst,” Brisbane said crisply. This pronouncement catapulted into one rubbish heap many of the philosophies and moralities that I had considered supremely important. How could Brisbane’s fealty to his employer interfere with an undertaking to keep confidential a prospective service to that employer? I might have asked, “How does he get that way?” The same question would have been pertinent from time to time with each of several of his colleagues. They employed exactly the same verbiage on varying pretexts. A psychiatrist might have discerned in this an endemic pathology. He would have been in error. It was a simple game of “follow the leader”—imitation of a master of tergiversation. Merrill, who was an associate of Brisbane and Carvalho on the New York World, had followed them into the Hearst fold. He brought for them, and received from them, the same treatment of refrigerated neutrality that had furnished bystanders in the Pulitzer organization a continuously edifying performance. It was my first contact with undeclared warfare. My request for cooperation had given Brisbane a morsel of news for Carvalho about one of Merrill’s impending projects. Of course, this scheme must be scuttled. It is only fair to Carvalho to say that as much principle as personality may have entered into his motive. He was opposed to special editions on general grounds. In the first week my earnings exceeded $2,400. That didn’t seem legitimate. More than half this amount accrued through one contract signed by B. F. Yoakum, Chairman of the Board of both the St. Louis and San Francisco Railway and the Chicago, Rock Island and Pacific Railroad. Bradford Merrill was present at my meeting with Yoakum. That fact later assumed especial importance. Early in June, a telegram reached me in Chicago from Fred C. Veon, advertising manager of the New York American. It advised me to hurry east. “Terrific gale blowing,” the wire ran. “Come immediately or it may be too late to bail the boat. Better telephone me before coming to office.” From Veon, such whimsicality betokened extreme urgency. He was funny only when he was frantic. Veon’s troubles had begun when Yoakum’s secretary telephoned suggesting “a method to minimize unpleasantness.” It would be more agreeable to Mr. Yoakum, Veon was told, if the matter were disposed of by returning to him the original contract instead of effecting a cancelation with an exchange of letters. Mr. Yoakum preferred not to have any further correspondence about this business. The fog in which that left Veon had not fully dispersed when he recited the incident to me two days later. He had consulted his chief, Merrill. “The Silver Fox” was unable to hide his irritation over the episode. He had no specific instructions. But he would “think aloud” in an effort to help Veon organize the facts. Yoakum probably was under the impression that a representative of the New York American had expressed a willingness to cancel the agreement for advertising in the special edition. Since neither Veon nor Merrill knew anything about this, they must turn elsewhere for information. A remark that somebody in the cashier’s office had dropped the other day might supply a lead. It had to do with some sort of notice about checks for Koenigsberg. No more were to be countersigned without Carvalho’s okeh. Merrill would look into this. Meanwhile, a constructive result might be hastened if Koenigsberg ascertained from Carvalho the reason for the order. Veon, as Koenigsberg’s friend, might bring this about. No model of conversational decorum was set up during my call on Carvalho. In fact, it was the stormiest business interview of my experience. Carvalho started at me hammer and tongs. The advertising contracts for the special edition had been negotiated without proper authority, he said; therefore, they had been obtained on false representations; that meant they were fraudulent; he had repudiated those that reached him and he would continue to repudiate any that came to hand. My self-control during this tirade may have been partly discredited by the language in which I answered Carvalho. My only regret afterward arose from the shortage of my vocabulary. Carvalho seemed less affected by the epithets I flung than by the evidence I offered. First was my formal agreement with Merrill. Next came a copy of a prospectus for the special edition, indorsed with Merrill’s signature. Then I referred to Hearst’s assent. Carvalho reached for the oversize shears with which he sometimes found relaxation in a tonsorial trick. His hands were too shaky at the moment for that pastime. They weren’t steadied by the list of gravamens on which I proposed to take action against the New York American and everyone who tried to besmirch the propriety of my professional conduct. The legs of outrage sped me from Carvalho to Merrill. But one didn’t brawl with “The Silver Fox.” Usually, one could not be sure, until it was all over, whether the grievance presented by a caller actually belonged to the visitor or to Merrill. While no such doubt could have befuddled me, my rage did respond to the mellowing influences of a friendly discourse. Merrill’s theme was the great superiority of a wholly satisfactory redress over litigation of any sort. It would have annoyed me greatly to believe that I had yielded to blandishment. But there was no sign of anything else “The Silver Fox” used to hold me in line. And, pending the reparation, of which he gave intimation without stipulation, it became apparent that he was responsible for our joint difficulty. Our embarrassment was due more to his Fabian tactics than to any other factor. It seemed judicious to tell him so. The vexations of that waiting period pointed to another unhappy consideration. Friction of varying kinds had brought down upon me the violent opposition, the open disfavor or the untoward inclination of Hearst’s six leading lieutenants. In the order of their importance at that time, they were: Carvalho, Brisbane, Merrill, Lawrence, Coates and—again—Farrelly. These were then the most active members of Hearst’s newspaper cabinet. In August, Hearst returned from abroad. Again a dispatch from Veon caught me in Chicago. “Mr. Carvalho has a message for you from Mr. Hearst,” it read. “When can you be here?” That struck a note quite different from Veon’s previous summons. It gave promise of clearing skies. Of course, the meeting with Carvalho was difficult for both of us. But the burden was on him. He had to talk. And it wasn’t to his liking. There were no salutations. “Mr. Hearst has decided to abandon that special edition,” Carvalho began, the instant I entered the door. This, in itself, was a complete face-about from the position he had held in our last torrid exchange. At that time, he questioned the validity of my authorization from Merrill. Now he admitted, by inference at least, that there had been an acquiescence from Hearst himself. Merrill’s off-schedule enterprise had never aroused my private enthusiasm. Similar ventures had repelled me despite the lure of seemingly great earnings. Expenses might shrink the profits to an unattractive net result. And managing a special edition might eventually detract from my journalistic rating. Carvalho had said nothing about the term of the agreement I was to sign or the amount of salary it would fix. The scent of a striking personal victory invited a buoyant mood. I would make the gesture of ignoring these items. But the triumph must leave no shadow of impropriety. “It was never my intention to oppose Mr. Hearst’s wishes about this,” I replied with an assumption of frigidity. “On the contrary, I have been attempting to carry out plans that he assured me he favored. But he has a perfect right to kill any edition of any newspaper he owns. In this case, there are obligations to be met. All commissions that have been earned must be paid. That applies to the solicitors I have employed as well as myself.” The readiness of Carvalho’s concurrence astonished me. My new contract provided the same compensation I had been receiving. It was with Star Company, the holding unit that was then the base of the Hearst corporate pyramid. It documented a business regime that only a novelist could reconcile with actual business. It stirred the imagination for fanciful parallels. In one, Carvalho appears as Richelieu to Hearst’s amused Louis. This fantasy became substantial enough to fasten on Carvalho the office nickname of “The Richelieu.” We continued at swordspoints until the summer of 1913. Then Carvalho volunteered the conclusion that he had been mistaken about me. There was no offer of requital. But the admiration that had meanwhile grown up for the rare intellect and rarer integrity of this remarkable man fostered an eagerness to accept a friendship which has since given me real pride. I can understand an artist maintaining anonymity when they produce a bad strip, but when they produce something wonderful it certainly is a shame not to take credit. 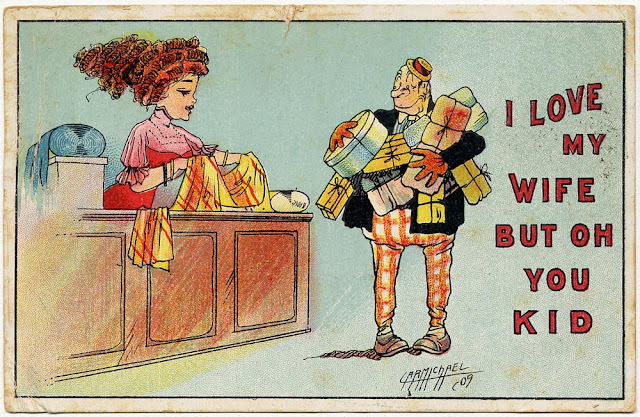 That's the case with The Career of Cholly Cashcaller, which ran in the Chicago Tribune's Sunday funnies from June 26 1904 to February 26 1905. It was usually unsigned, except on rare occasions when the artist would monogram it "G". I haven't a clue who "G" is, and I don't know of any Trib artists who might fill the bill. 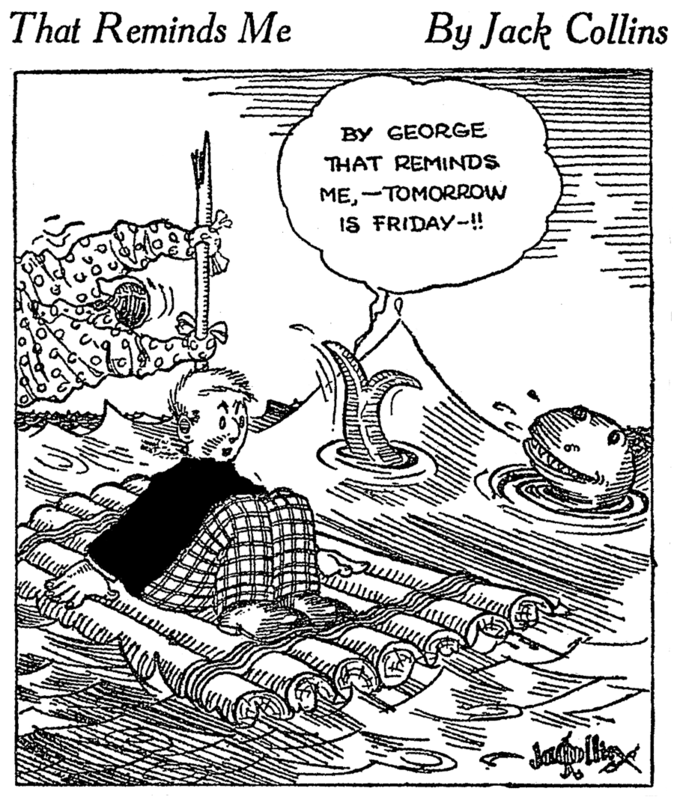 This delightful strip stars a wet-behind-the-ears but very earnest young feller trying to make good in business. He reads an endless series of "How to Succeed" books that promise to teach him how to become the next Rockefeller, tries to put the lessons into practice and invariably finds that in the real world things don't go quite the way they do in books. Both the art and writing on this feature are delightful, and far above the level of the typical slapstick shenanigans of that era's comic pages. 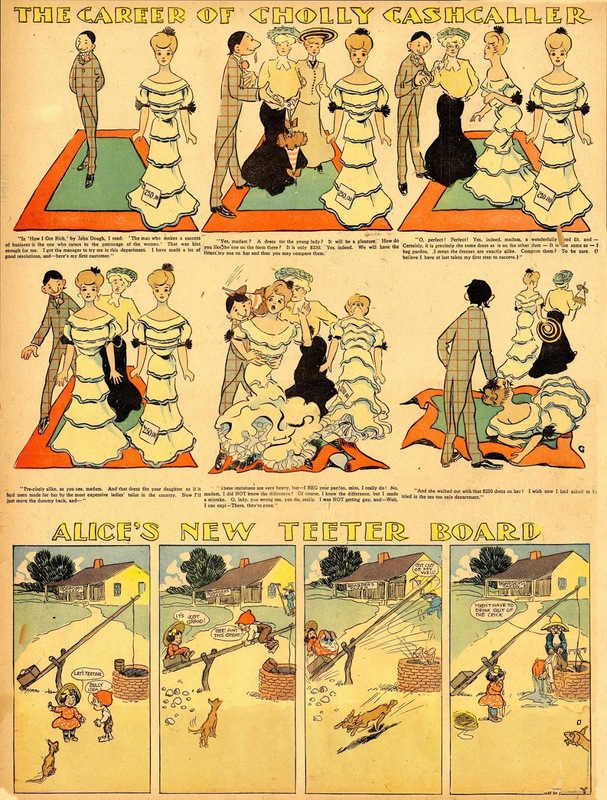 In fact, the strip was often accompanied on the same page with Alice's Adventures in Funnyland, an utterly typical strip of the day. Rotten kids? Check. Stereotyped characters? Check. Dialect that's supposed to be funny, but just makes it hard to read? Check. I've included those strips on the scans above since they provide such a stark contrast between the typical dreck and this fabulous material. If you'd like to read more of Cholly's misadventures, head over to Barnacle Press, which offers a nice selection of them. Thanks very much to Cole Johnson, who supplied the above samples. John V. “Jack” Collins was born in August 1898 in New York according to the 1900 U.S. Federal Census and his Michigan death certificate. In the census, Collins was the youngest of three sons born to Thomas and Mary. They were in Collins’ maternal grandfather’s household which included three uncles and an aunt. They all lived in Buffalo, New York at 425 Otto Street. The 1905 New York state census recorded Collins, his parents, three brothers and two sisters in West Seneca, New York at 73 Fifth Street. Collins’ father, a train conductor, was the head of the household that included four relatives and four boarders. Collins’ mother, a widow, was the head of the household in the 1910 census. Collins, his five brothers and sister were Buffalo residents at 589 Perry Street. The household included his mother’s brother, sister and brother-in-law. 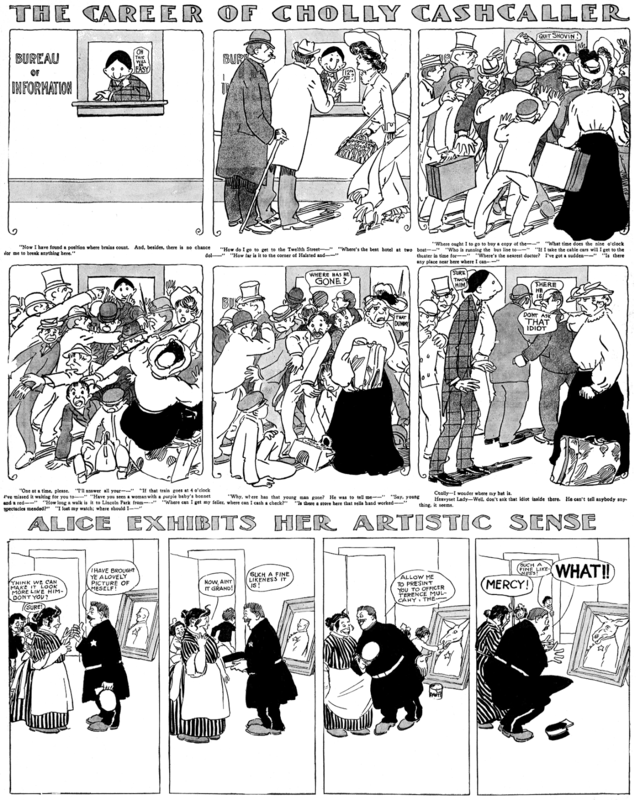 Cartoons Magazine, April 1916, carried an advertisement for the Associated Art Studios that said “Mr. Jack Collins, Sport Cartoonist, New York Evening Telegram. Mr. Collins is 16 years of age and is the youngest Sport Cartoonist in the U.S. His work appears in the Evening Telegram and is on a par with any of the sport cartoonists. 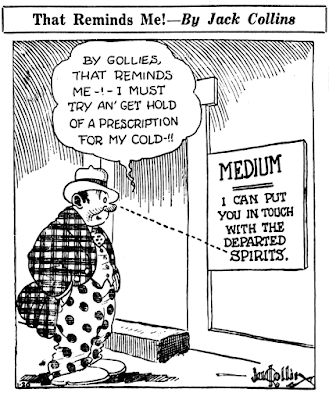 Our method secured Mr. Collins this position.” One of Collins’ Telegram cartoons was reprinted in The Outlook, October 23, 1918. During World War I, Collins enlisted in the New York National Guard on July 20, 1917. He was transferred to the 105th Machine Gun Battalion of the 27th Division. Collins served overseas from May 18, 1918 to March 6, 1919 and was discharged April 1, 1919. The 27th Division produced its own newspaper, Wadsworth Gas Attack and The Rio Grande Rattler. When Collins contributed to the newspaper it had been retitled Gas Attack of the New York Division. 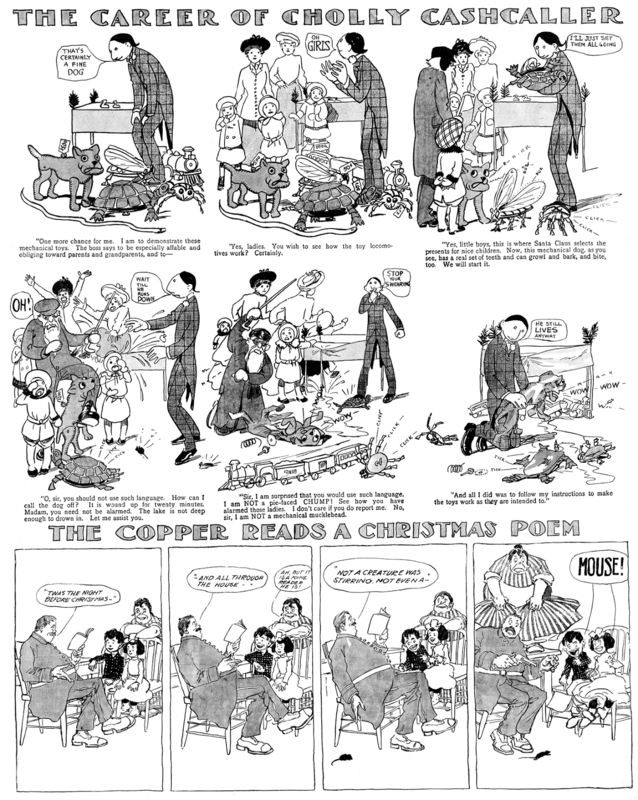 Collins appeared in the December 25, 1918 issue, here and here, and in the March 1, 1919 edition here, here and here. 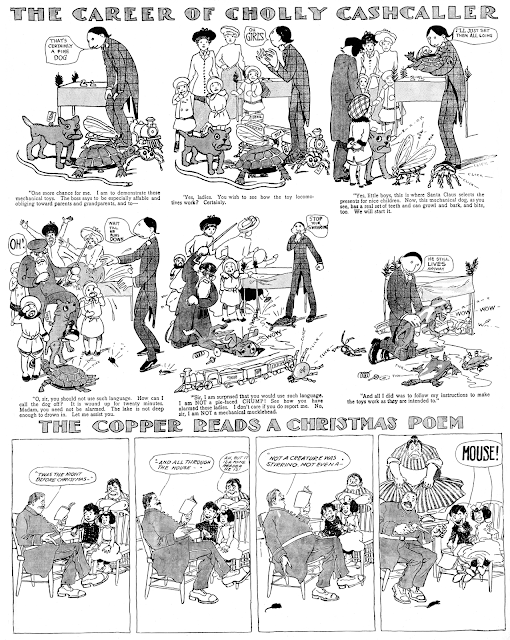 Collins was mentioned in The Fourth Estate, February 1, 1919, which reported on the Christmas issue. The Christmas number of the Gas Attack, a well edited magazine, published by the 27th American (New York) Division, December, 1918, and written and illustrated on the Western front, has been received in this country. Major General John F. O’Ryan, commander of the division, is the honorary editor; Lieutenant-Colonel J. Leslie Kincaid, directing editor; Major Tristram Tupper, editor; Private Leslie W. Rowland, assistant editor; Private Raeburn Van Buren, art editor; Captain William J. Granger, business manager. The publication is dedicated to the land from which the division came—America came and the land in which some of them fell—France. The foreword is by Major General O’Ryan, with a splendid sketch by an Buren, drawn from life. The leading article was written by Leslie W. Rowland, formerly of the Pittsburg (Pa.) Gazette-Times editorial staff, who tells what the 27th Division has been doing in France since leaving the training camp at Spartanburg, S.C. last April. 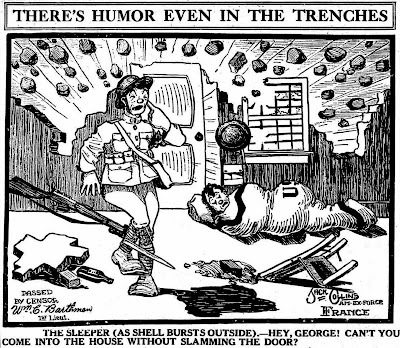 Sergeant Harry T. Mitchell, another former reporter on the Gazette-Times, has contributed several good articles; there is a full-page cartoon by Jack Collins, several drawings by Van Buren, and exceptionally well written stories and poems by various other members of the division. In the 1920 census, newspaper cartoonist Collins, two sisters and a brother were in their mother’s household in the Bronx, New York at 2377 Grand Avenue. Collins’ sister, Eleanor, was a “sketcher” at a newspaper. The Los Angeles Herald (California), October 19, 1921, published this item. Jack Collins, the cartoonist who succeeded Larry Semon on the New York Evening Telegram, is now drawing the daily syndicated comic strip depicting the adventures of Fanny Fillum, the fillum fan. In one of the cartoons Larry Semon appears. 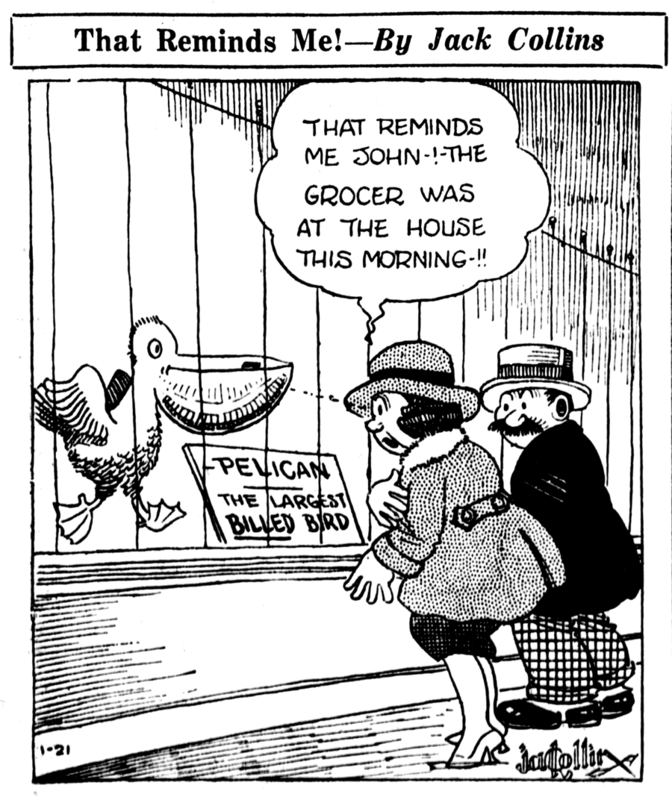 American Newspaper Comics (2012) said Collins drew the panel That Reminds Me, from 1921-22. At some point the Collins family moved to Detroit, Michigan. On February 1, 1926, Collins married Mabel Rineholz in Detroit, according to the Michigan marriage records at Ancestry.com. The 1930 census said Collins’ mother was married to Jerry O’Brien. Collins, his wife and siblings were part of the household in Detroit at 1977 Oakdale Avenue. Collins was employed as a “stationery fireman” in the construction trade. Collins has not yet been found in the 1940 census. Collins passed away October 25, 1942 in Eloise, Michigan according to his death certificate at Ancestry.com. He was divorced. I will hazard to guess that Collins move to Detroit might not have been too far after the New York Evening Telegram 1924 merger with the New York Evening Mail. It would not surprise me that the merger cost him his job. If he was unable to get any further work in NYC, he decided to move to Detroit for work, which was booming at the time. By that time period Detroit was down to three dailies (Free Press, News, Times) with couple other short run dailies rising and falling in the 20s and 30s. It might be possible he originally left for a cartoonist gig in Detroit that didn't pan out. Then found work elsewhere. All speculation though. I get a bit of a kick out of cartoonists who evidently work harder on their signatures than their actual cartoon. Jack Collins' cartooning looks to be straight out of a correspondence school, but man that is one finely wrought signature. To my knowledge Collins only has one syndicated feature to his credit, and he pretty much guaranteed it wouldn't last very long. His panel, That Reminds Me, depends for its humor on delivering the same punchline every single day. An incredibly creative cartoonist can get away with that for quite awhile, but they need to show WAY more ingenuity to keep such a feature fresh than Collins does (see And the Worst is Yet to Come for an example that actually works). In my book I say that this feature was penned for the Brooklyn Eagle, but I was wrong. It was actually distributed by Philadelphia's Ledger Syndicate. 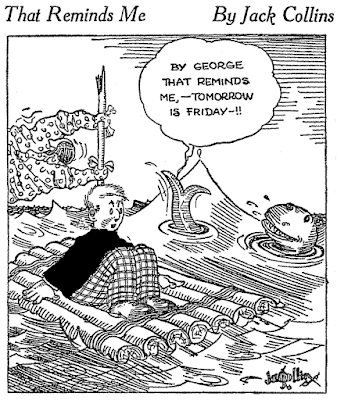 The panel began on June 13 1921, and I can trace it now as far as December 1922, but by then I can only find it in the L.A. Times, which cuts off the dates on the panel, and runs it at least little late, so I cannot offer an exact end date. That has got to be one of the least clever cartoon features I've ever seen! PS _ I owe you an email. I'll write it as soon as my work deadline is over.